Did I mention that my mind is wandering to blue seas? I crave sunshine and blue skies, however I’m here for now and so I shall make the best of it. While my favourite winter sport is planning my annual escape I do indulge in some other pastimes. There’s evenings on the couch with plates of goodies, glasses of fabulous wine and movies. There’s bundling up and strolling by the lake to check out super cool natural ice sculptures. There’s scrabble games and fireplaces. And I might even get out my ice skates later this week. Tell me, what’s your favourite winter activity? 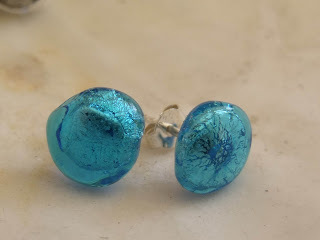 This months’ prize is a pair of Blue Ocean Stud Earrings, something to help you dream of summers approach. To enter the giveaway: email me – catherine@sailorgirl.com – and tell me, and tell me about your favourite winter activity.